A taller stylish slipper for women, with a higher rubber outsole perfect for indoor/outdoor usage. This lightweight slipper comes with a Dr. Comfort gel insert and has a toe-box for extra protection. 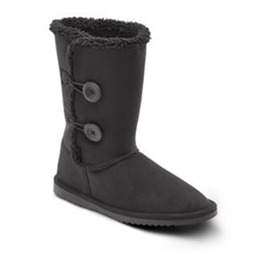 The microfiber upper with button closures makes it easy to slip them on your feet. 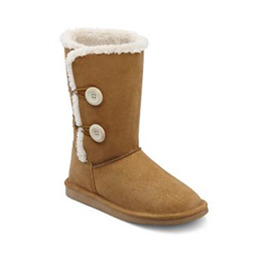 The fleece lined interior ensures a snug fit, reducing the chance of abrasions. With a Scotchgard protected outer material, the slippers are great for going outside to grab the paper or relaxing in your home. Available in colors Camel or Black.